Partypro offers the most extensive line of solid colored tableware on the web. Whether you are entertaining a small or large crowd partypro has all of the discount party supplies to meet your needs. 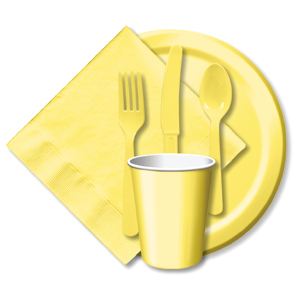 You will find both paper and plastic offered in plates, cups and tablecovers. Our bulk colored tableware is also offered if you are having a large event or sponsoring a corporate party. Our selection of centerpieces and confetti will put an added flair to your party decorating. Check out wikipedia.org/wiki/Party_planning for party planning assistance, or look at Partypro's party ideas for decoration and product tips. A great color for luau parties. and to compliment a tropical theme. An up-scale look in plastic plates and bowls - Features clear plastic plates and bowls in "Resposable" (refined disposables), "Squares" and "Triangles". A great color for catering events. A great color for fall parties. A great color for floral party accents. A great color for breast cancer awareness events. Great for outdoor events like Nascar & Derby Day Parties. Great for St. Patrick's Day Parties. Great for 50th anniversary parties. Great for Mardi Gras parties. This color is also known as "SCHOOL BUS YELLOW"
Great for luau parties.This color is also known as "HOT MAGENTA"
Great for accenting designer prints. Great for baby shower parties. Great for Super Hero parties. Great for catering events.High Quality Disposable Ware That Looks Like Linen! A great color for halloween parties.This color is also known as "SUNKISSED ORANGE"
Great for Mardi Gras parties. Great for fireman parties.This color is also known as "CLASSIC RED"
Great for 25th anniversary parties.This color is also known as "SHIMMERING SILVER"